The alternate artworks for Glory Maelstrom and Descendant have been revealed during stream. 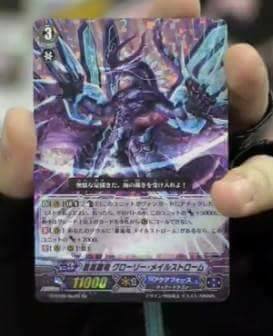 [AUTO](VC)[Limit Break 4]:[Counter-Blast 1 & Choose three cards with “Eradicator” in its card name from your hand, and discard them] At the end of the battle that this unit attacked, if the attack did not hit during that battle, you may pay the cost. If you do, [Stand] this unit, and this unit gets [Critical] +1 until end of turn. This ability cannot be used for the rest of that turn. [ACT](VC):[Counter-Blast 2-card with “Eradicator” in its card name] This unit gets [Power] +5000 until end of turn. [AUTO](VC)[Limit Break 5]:[Counter-Blast 1] When this unit attacks a vanguard, you may pay the cost. If you do, until end of that battle, this unit gets [Power] +5000, and your opponent cannot call grade 1 or greater units to (GC) from his or her hand. [CONT](VC):If you have a card named “Blue Storm Dragon, Maelstrom” in your soul, this unit gets [Power] +2000.